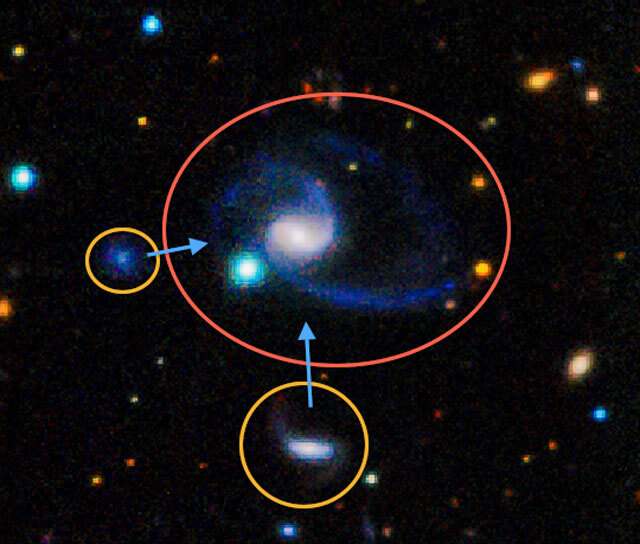 An international group of astronomers has announced the discovery of two groups of galaxies that are just like ours. The Milky Way Galaxy is a fairly typical galaxy, but when paired with its close neighbors – the Large and Small Magellanic Clouds – it is very rare. The team, led by Dr Aaron Robotham of the International Centre for Radio Astronomy Research (ICRAR), and the University of St Andrews in Scotland, searched for groups of galaxies similar to ours in the most detailed map of the local Universe yet, the Galaxy and Mass Assembly survey (GAMA). “We’ve never found another galaxy system like the Milky Way before, which is not surprising considering how hard they are to spot! It’s only recently become possible to do the type of analysis that lets us find similar groups,” said Dr Robotham, lead author of a paper, published in the Monthly Notices of the Royal Astronomical Society (arXiv.org version). “Everything had to come together at once: we needed telescopes good enough to detect not just galaxies but their faint companions, we needed to look at large sections of the sky, and most of all we needed to make sure no galaxies were missed in the survey,” he added. “We found about 3% of galaxies similar to the Milky Way have companion galaxies like the Magellanic Clouds, which is very rare indeed. In total we found 14 galaxy systems that are similar to ours, with two of those being an almost exact match,” Dr Robotham explained. The Milky Way Galaxy is locked in a complex cosmic dance with its close companions the Magellanic Clouds, which are clearly visible in the southern hemisphere night sky. Many galaxies have smaller galaxies in orbit around them, but few have two that are as large as the Magellanic Clouds. The study also found that although companions like the Magellanic Clouds are rare, when they are found they’re usually near a galaxy very like the Milky Way, meaning we’re in just the right place at the right time to have such a great view in our night sky. “The galaxy we live in is perfectly typical, but the nearby Magellenic Clouds are a rare, and possibly short-lived, occurrence. We should enjoy them whilst we can, they’ll only be around for a few billion more years,” Dr Robotham concluded.